Enjoy spectacular views from romantic and luxurious oceanfront cottages, suites or vacation homes. Hot tubs, fireplaces, private wharf, fishing charters, whale watching, kayaking, mountain biking and hiking. Enjoy the elegant but comfortable relaxation of our B&B home... new but with Old World Charm... large rooms, vaulted ceilings, double and queen beds, private baths, soaker tub, TV & VCR, library, all on the waterfront. 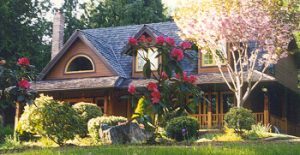 Down a maple lined lane, away from the highway and nestled among stately cedars is our west coast style bed and breakfast/vacation rental. Just 30 minutes from Victoria, . See the city, sleep in the country. The word "SKOOKUM" is taken from the Chinook Trade Jargon of the west coast of Canada and means simply, "Really Good". We believe you will have a really good time at SKOOKUM B&B as you relax in our Cape-Cod style home on three private forested and landscaped acres. We offer you seclusion and comfort just 30 minutes from Victoria. 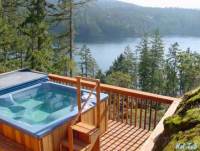 Visit our rural oceanfront Bed & Breakfast accommodation located on Sooke Basin and close to East Sooke Park. King, queen and twin beds, private baths, oceanfront room with 2 person hydro-massage tub. Fishing and sightseeing charters.